I am a constructed player at heart. I play online to play cool decks. Sometimes I am trying to build competitive decks, sometimes fun combos, sometimes weird theme decks. Some are intended to win tournaments, some to do bizarre stuff in casual multiplayer games. I want to build them all â€“ and Iâ€™m trying to build a collection to let me do that. I also have a budget. I have to be selective in what I buy. Eventually, I want to be playing, competitively, in all formats â€“ and that most definitely includes Extended. I have developed some principles of for selecting which cards to invest in to allow me to do that. So far, the principles seem to be working. Some background. I have been playing paper Magic forever, but did not get online until my telephone company finally upgraded my lines almost exactly two years ago. 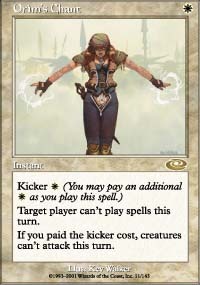 At that time, Betrayers of Kamigawa was about to be released, while Champions of Kamigawa, Mirrodin block and 8th Edition were for sale in the Online store. As I was first starting out, I mainly played in Mirrodin and 8E leagues. 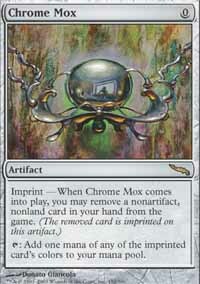 I knew there were a ton of Mirrodin cards I wanted, including a lot of the commons. 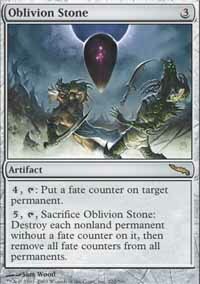 I also knew that Mirrodin would not be available for long, but Kamigawa block would be. Finally, Mirrodin, and especially 8E, were simpler formats, so I was better able to win packs in those formats. Since I was still learning the interface, Kamigawa blockâ€™s Splice Mechanic, and so forth, was a pain. Besides, I was drafting a lot of Kamigawa in paper, and I wanted some variety. After six months of that, I had enough cards to play casual decks, especially in the multiplayer room. I was also able to play some PDC and so forth. About then, I began sinking my budget into a mix of boosters (for draft and league play) and singles. At this point, I am buying and trading for cards with an eye on Extended after the next rotation, while playing fun but competitive decks now. Years ago, I traded away a spare (paper) City of Brass. pic=(City of Brass) A few weeks later, I realized I wanted to have two decks built simultaneously, and that shifting Cities of Brass back and forth was a pain. I started reviewing my decks and play styles. I quickly determined that, although both my wife and I might be playing a given land, especially dual lands, we were almost never playing the same creatures. Moreover, while a double playset of any colored card was probably enough, we would often have a half dozen paper decks that all wanted Cities of Brass, dual lands and so forth. Since that time, I have followed a simple rule â€“ I always trade for multicolored lands, and never trade those lands away. 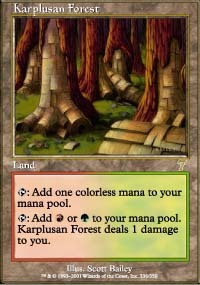 Right now, my wife and I own something like a dozen Bayous (the original Forest/Swamp dual land) - and all of them are in decks. Yes, having the ability to have one playset appear in a dozen MODO decks simultaneously is one of MODO's great features. The point, thought, is that the lands go in lots and lots of my paper decks. If you plan on playing anything, in any format, and you are not using the Onslaught Fetchlands, then get a playset of the Ravnica duals in your favorite colors. Yes, they are expensive. And they are worth it. Once you have the duals, look at getting the painlands (e.g. Adarkar Wastes) in the same colors. Consistency is everything in a mana base. However, while the dual lands will be important and valuable, the painlands may not be reprinted in Tenth Edition (due out this summer.) If that is the case, the lands will be less valuable, and not quite as necessary. However, they will still be useful, especially once the Onslaught fetchlands rotate out of Extended next year. Magic has some basic rules. You can play one land per turn. You draw one card per turn. You pay cards' mana costs. etc. Those are the rules of the game. However, Magic has an additional rule, called the Golden Rule of Magic. The golden rule is that a card can override the rules of the game. You draw one card per turn, unless a card says otherwise. You play one card per turn, unless a card says otherwise. You pay the converted mana cost, unless a card says otherwise. etc. All of the cards that let you break these rules of Magic have potential to create huge advantages. One of the best Magic theorists ever, Zvi Mowshowitz, talks about decks that "play fair" verses those that rely on rule breaking cards to "cheat." Zvi often stated that he was always happy to play against a deck that played fair, because he would beat it. If you want a good example of not playing fair, look at the descriptions of Zvi's win at Grand Prix New Orleans in 2002. On one turn, Zvi drew eight cards, played out three lands and took two extra turns. That's nothing: Zv'is deck, Turboland, could generally play out all it's lands, draw i's library and take infinite turns. And that was the bad version of the deck; the one that remained after Wizards banned the cards that made the original version rock. Sure, that was paper Magic, and Turboland was built around Exploration, Horn of Greed and other, paper-world-only cards. However, cheat cards exist online as well. 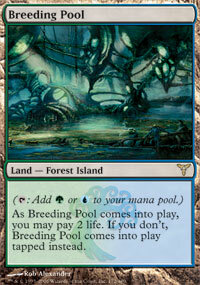 For example, some cards let you get creatures into play without paying thier full mana costs. Can decks be built around those online cards? Cards like these? Even Affinity is a method of cheating cards into play, and lord knows that Affinity was (and is) a broken deck. Not every method of cheating on mana costs necessarily spawns a deck, but most have the possibility of doing so. You want to keep an eye on such cards. Cards that break other rules of Magic can be equally good. Take the "draw one card per turn" rule; cards that break that rule can be good, and valuable. The most expensive card in Magic is Ancestral Recall, and all it does in draw cards. The most expensive uncommon online is Fact or Fiction, and all it does is draw cards. I just bought my fourth Gifts Ungiven - and Gifts is amazing. Card drawing is a dangerous mechanic. Wizards prints a lot of card drawing spells, artifacts and creatures. Many are marginal to bad: think of Greed and Archivist. Others are so broken they get banned (e.g. Skullclamp.) Others are so situational that they may or may not see play. For example, Ancestral Vision is an amazingly cheap card to cast, but the suspend mechanic makes it far too risky right now. It is seeing no constructed play today, but if Wizards prints an answer to the suspend problem, it could rapidly become broken. For that reason, I will keep any I draft until I get my playset, then hang onto them. Other cards let you break other rules of Magic. Burning Wish, Cunning Wish and Living Wish let you get cards from your sideboard during the match; and all three are heavily played, and very desirable. 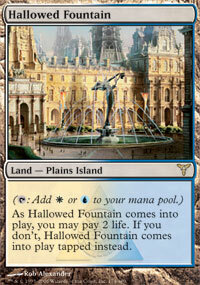 Illusions of Grandeur, 3U, Enchantment, Cumulative Upkeep 2. Donate, 2U, Sorcery, Target player gains control of target permanent you control. None of those decks ever existed online, but you can read about Trix here and Jar Grim here. Yes, the most broken deck ever used this card as a kill. The point of all this is that I am accumulating playsets of cards like Megrim, just in case Wizards ever makes a mistake like that again. I am also looking for cards like Hypergenesis. It sux right now, but it does let you cheat permanents into play, It might prove extremely useful if Wizards prints the right cards sometime in the future. Hosers are cards that invalidate the strategies other decks use to win. 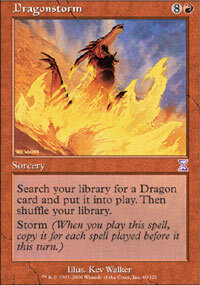 For example, Rule of Law and Arcane Laboratory are hosers for storm decks. 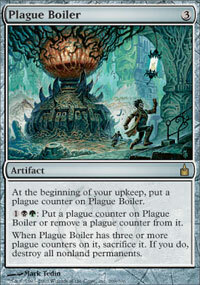 Engineered Plague is a hoser for Goblin and/or Saproling decks. Tormodâ€™s Crypt is an obvious hoser for graveyards, but so are Scrabbling Claws and Withered Wretch. Those last two illustrate one good point about hosers: they are not all great. Both Claws and Wretch were legal when Ichorid decks were dominating Extended. For that matter, Baleful Stare is technically a hoser, but about the only thing it can really mess up is your rating, if you are foolish enough to play it. One nice thing about hosers is that they are not always that good in limited, so they can come around late in draft. For example, I got my playset of Sacred Grounds as late picks in 8E and 9E drafts, and although I haven't had to play them, it is nice to know they are there. Hosers come in all flavors. is a hoser, both for storm decks and aggro decks. Generally, unless I am looking for a card that I intend to play in a deck immediately, I have only been buying green and artifact cards. I am a green mage at heart, so I have invested is cards like Troll Ascetic and Wall of Roots in the past. However, aside from tournament staples like Wrath of God, I try to avoid buying cards outside of my favorite colors. I wait to pick those up in drafts, or if they are real bargains. But, as I said, I do buy cards if I need them for a deck. Most often, I find that I have a acquired a couple of some particular rare in drafts, and want to build a deck around it. In that case, I may grab another copy. That's not investing; however, that's building a deck. Right now, I am looking at Extended decklists from the paper Pro Tour Qualifiers. A few artifacts are extremely common â€“ showing up in a lot of decklists of all flavors. Engineered Explosives, Pithing Needle and Chalice of the Void are ubiquitous. I just bought my playset of Chalices, but I paid 6 TIX, while I could have paid 2-3 had I bought them a few weeks ago. The trick is to identify cards like those -- cards that could be very useful -- and buy them before they start appearing in a lot of Tier One decks. For that matter, highly useful removal and counter spells come under the same heading as hosers. I have playsets of Lightning Helix, Mortify, Putrefy and Remand, and I am hanging onto those. They are just plain good. Years ago (and I do mean years ago) deckbuilders lived by the Morphling rule: if it costs five mana, it had better win you the game. Morphling was, in effect, a 5/1 unkillable flier with vigilance and a 1/7 flying wall for 3UU. It was it's era's best win condition. More importantly, if you spent more than five mana and a card on anything, it was likely to be eliminated by something that cost a lot less (e.g. Wrath of God, Swords to Plowshares or Counterspell.) I could write a slew of articles on the details, but the short answer is that if you are spending a lot on doing something, and I am spending very little on stopping you, I have a lot of resources left over to play my win condition. The Morphling rule is still generally true today. Any Extended format is going to have a lot of cheap removal and counters around, so you cannot afford to play really expensive cards. Aggro decks do not play anything costing more than four, and most aggro costs far less. (No, Myr Enforcer is not an exception. If an Affinity player actually pays seven mana for an Enforcer, something is seriouslywrong.) UW Tron might be more of an exception, but even those decks don't tap more than five lands to play Platinum Angel. Well, they almost never tap more than three lands. In short, I don't ever expect to be playing high casting cost creatures, except in casual games. That means that I may want a Darksteel Colossus, but I am not going to spend TIX for one (unless I can see some way to cheat it into play.) Likewise, although Phantom Nishoba is in all ways -- except mana cost -- a better creature than Phantom Centaur, I own and play the Centaurs, not the Nishoba. I may make exceptions for certain highly useful cards, but most of those are played as singletons, so I may get one or two. Before I invest in more than one, I would have to see proof that the card works. I can see collecting playsets of Mindslaver, Tooth and Nail, Dragonstorm and Mind's Desire: those are proven cheate cards of great power. They are about the only exceptions. For everything else, if it costs more than 5 mana, I am not buying. I try to avoid buying any standard legal creatures, unless I absolutely need them for a deck I intend to play immediately, and play a lot. Standard creatures, unless they are completely useless, are generally expensive. The really good ones cost a lot of TIX. That does not last. Once the creatures rotate out of Standard, their price generally falls like a stone. Take a look at Keiga, the Tide Star for example. 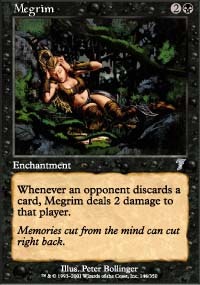 Keiga was one of the best Standard creatures in the format at one time, and cost 10 TIX or so. Now she's justly slightly over one TIX. The second reason is that I play limited, and I can expect to pick up many of these cards in drafts or release events. Even when I play constructed*, I may win packs, and I'll draft with those packs. The odds are that I will get the Standard cards sooner or later. The exceptions, of course are any cards that I really need for decks. And lands. I know that the lands will keep their value, and if I get lucky enough to draft a fifth Steam Vents, I can always trade it for packs or TIX. I mentioned the rotation before. In 2008, Extended will shift, and all the Onslaught, Odyssey and Invasion block cards will no longer be Extended legal. They will be legal in Online Classic, but I donâ€™t expect to play that format much. I also expect that many of the cards from those sets will drop in price once the rotation happens, just like the change when cards rotate from Standard. For that reason, I am concentrating on filling my collections of Mirrodin, Ravnica and Champions blocks, not the older ones. 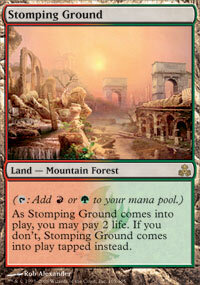 Of course, I just bought a playset of Astral Slide from the MTGOTradersbot. I looked at my collection, thought about Slide decks, and realized that I had pretty much everything but the Slides. I know that Slide is a competitive deck, so I wanted to try it out. I will pay a TIX or two for that. I am also thinking that, once people find out that Slide is making T8s in paper PTQs, it's price may well jump, so I will get mine now. 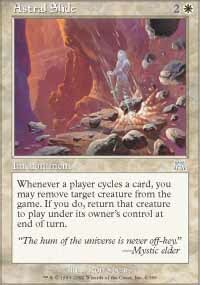 I am also making an exception for the Onslaught fetchlands. I will get a playset of each, and I expect to play them pretty much forever, even in casual games. My standard is paper 5color magic: the paper equivalent of Prismatic. That format allows the Power 9, and practically every broken card ever printed. 5color decks also start with all 20 Onslaught fetchlands. That's good enough for me. In general, I try to target cards that I can tell are strong. However, I also try to pick up some of the specialty / rule breaker cards when their prices drop to very low levels. 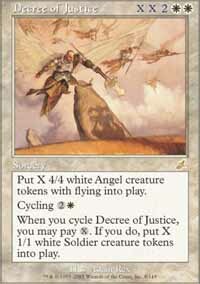 I bought a playset of Blinding Angels once, when their price had dropped to 4 for a TIX. Most recently, I bought a playset of (Serum Power)s. Serum Powder (a/k/a Mulligan Mox) is unique in that it allows free mulligans. So far, even combo decks have not wanted that ability. However, if such a deck ever does appear, Mulligan Moxen will leap in price. I'm investing one TIX now on the off chance that I will save a bunch of TIX far in the future. FWIW, here's my want list, and recent purchases. Chalice of the Void is really, really good, and will remain so. I got mine already. Engineered Explosives is the closest thing to Pernicious Deed I can afford, and Trinket Mage can fetch it. I expect this to be played in Extended until the 2011 rotation takes it out. Sundering Titan is such a beating, for decks that can get it into play. I bought one. That is probably enough. Razormane Masticore was another recent purchase. It costs just five mana, often wins the game, and it is an artifact, so it splashes well. It follows nearly every rule above. Armadillo Cloak is actually really good in GW aggro decks. However, it is going to rotate. I bought two a while back, for a couple cents each. Now they are well over 2 TIX, so I am not buying more. I'm working on a playset of Tooth and Nails, and I'll eventually get four Dragonstorms. Both of those archetypes will be pretty much intact, even after the next rotation. The same can also be said of Affinity, although I'm not sure I want to play that deck. I never did like it. 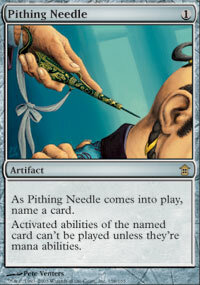 Finally, I am going to grit my teeth and buy a set of Pithing Needles. Needles are really expensive, mainly because they are really good. Now it's time to go play some Extended with my new Astral Slides. Hey Pete, check this link out to fix your cardlinking problems. I really liked this article. Different than the Blieweiss articles on MTGO, because it teaches a way to look at things and make decisions about what to purchase. I started around Kamigawa online, and so many of the cards from older sets are tough to get. Focusing on the post-rotation extended is a great idea.